Salem is one of the largest cities in Tamil Nadu. It is closely located to the Capital city Madras and the popular tourist destination, Yercaud Hills. The city is fourth largest in the state in terms of urbanization. Salem is surrounded by beautiful hills and the Thirumanimuthar River that flows through the city and divides it into two parts. Being one of the fastest growing cities in Tamil Nadu, it is rapidly developing and has the record of being one of the busiest business centers of the state. If you are planning to pay a visit to this city for personal or office work, then accommodation is one of the important aspects that you need to look into. Most people think of staying in a hotel when they visit a new place. Few years ago, it would have been impossible to rent out an apartment when they are in a new city. Hotels were the best choice for every tourist or traveler. However, today, many people find it more comfortable to rent out a service apartment that provides better and more personalized services to the tourists and visitors. It is always better to rent out a Service apartment in Salem if you are planning to visit the city. Why Service apartments are better than hotels? With the advent of service apartments, more people now prefer them to hotel rooms. Apart from offering better services, there are other obvious advantages that make them a better option. Call Now & Book: Although hotel rooms can be booked online, they do not offer personalized services. Booking service apartments online is indeed a great way to have perfect accommodation throughout your stay. You might be visiting Salem for few days or planning to stay here for few months. Whatever the duration of your stay is, make sure you book a Salem service apartment and enjoy your stay during the trip. A Cheaper & better option: Whether you are planning for a long stay or short one, service apartments are definitely a cheaper option when compared to hotels. They also offer you far more space than a hotel room, so if you are planning a trip with your family, booking a service apartment would be a better option. A service apartment accommodation has less in the way of overheads when compared to a hotel. This is the reason why you would notice a significant difference in the prices of accommodation when you rent out a service apartment. A Home Like atmosphere for rent: Choosing a Service apartment in Salem is a versatile option. Instead of having just a bedroom and a bathroom, you will have more space to live. Especially, if you are planning for a long trip, then service apartments are for more comfortable to stay. Service apartments offer personalized services and you will have more freedom during your stay. For example, if you are planning for a business trip to Salem where you will have to stay along with your family for few months, then renting out a Service apartment in Salem is definitely the best option. You will have the advantage of cooking food for yourself and you will also have more space to relax and enjoy your stay while you are not at work. They make you feel like home. 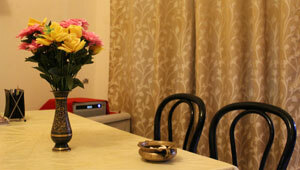 Service apartments provide homely comfort at lower rates. A wide range of service apartments are available in Salem. However, you need to remember few things before you choose a service apartment for rent in Salem. Most of the service apartments offer online booking facility. It is always better to book your accommodation in advance while planning your trip. Find a reliable Salem service apartment that will match your requirements. There are many services provided by service apartments. However, considering factors such as duration of your stay and budget choose the option that best suits your preferences and requirements. Salem is one of the largest cities in Tamil Nadu, a popular tourist destination and has a great economic importance due the presence of several public and private industries and business firms. With a little bit of research, it is very easy to find a service apartment in this city that caters to your needs. © 2013. Grand Stay. All rights reserved.